No matter what writing expertise you have, we bet you enjoy reading about the source of someone’s genius. There’s nothing like success stories or professional advice to unlock your inspiration. Luckily, we, at Unicheck, had a chance to talk to Stuart Aken, a great novelist and short story writer experienced in creating stories of different genres including science fiction, romance, and horror. Stuart has gone through many difficulties on his way and finally, he has found his own source of comfort. It was writing. Besides, Stuart has long started running his own website, which now has plenty of useful and engaging material that would certainly be of a big interest for you (the link to the site is given below the post). Read on to find out how Stuart manages to always create unique stories, what helps him stir his creativity, and what project Stuart is currently working on. Besides, there will be also helpful advice for newbie writers. Here’s the interview we are pleased to share with you! The originality of topic is impossible, of course. But a writer has a voice and it’s this that can still be original. Combine personally attractive themes with specially created characters you grow to love (or loathe!) and place those actors into the drama you devise. Allow them to find their way past, through or over the barriers you place and suddenly you have a unique piece of work. At least, that’s what we all hope will come of our efforts, I think. Although I rarely write pure romance, love is undoubtedly a huge part of what drives me to write. I see this extraordinary quality as a reason to be proud to be human. But I’m also moved by injustice and I’m drawn to stories that inspect and examine the way humanity can be appalling and grand, hateful and beautiful, honest and deceitful. We are a unique species capable of extreme cruelty and provided with wonderful talents and brilliant opportunities. To be able to join the ever-expanding line of storytellers seems to me a great and fabulous gift. Before you even start to write, beg, borrow or steal a copy of Dorothea Brande’s excellent book, ‘Becoming a Writer’. Read it. Do the exercises. If, when this is finished, you still want to write, then do it. But do it honestly. Otherwise, find another way of expressing your creative aspect. Writing is an overcrowded and hugely competitive, though supportive, community. If the only motivation for writing is the expectation of making money, find another outlet. Most writers never make a living from this passion we share. But if you’re driven to write, if it’s something you must do, then do it. But do it well; make everything you write your own and the very best you can produce. Describe the project you’re working on at this moment. 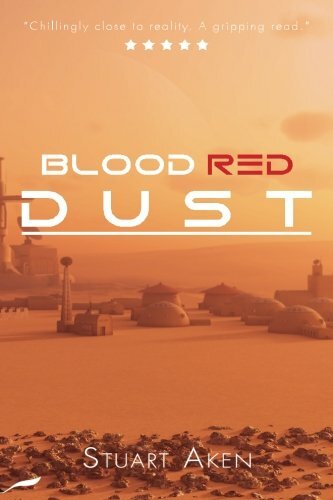 My latest release is Blood Red Dust, a science fiction novel set in 2074 on Mars. It examines the conflict between a small group of specially chosen colonists, who intend to form their own Utopia, and a group of nihilistic terrorists whose only aim is the destruction of all human life. I’m now starting the follow-up book, which is set…, well if I tell you that, you’ll know how the first book ends! Research is underway and characters are being created even as I write this. Many thanks for this opportunity to provide potential readers and new writers with information about me and my work. Willing to read more about Stuart Aken, his fiction, recently published story reviews, get practical advice on writing and more? You are welcome to visit Stuart’s website at http://stuartaken.net.